Introduction: The optimal management of upper ureteric calculus remains controversial. We compare the outcomes of antegrade percutaneous ureterolithotripsy (APCUL) with retrograde ureteroscopic lithotripsy (URSL) for upper ureteric calculus with respect to stone clearance, morbidity, and complication rates. Materials and Methods: This prospective study was carried out from December 2014 to June 2016. A total of 117 patients with upper ureteric calculus sized (10–20) mm who underwent APCUL or URSL were included in the study. Results: APCUL and URSL were performed in 64 and 53 patients, respectively. The mean age and stone size were comparable between the two groups. The stone clearance rate at 1-month follow-up was 93.75% in the antegrade group and 81.13% in the retrograde group (P = 0.036). Mean anaesthesia time was significantly longer for the APCUL group while the actual mean operative time was significantly longer for the URSL group (P < 0.001). The overall complication rate was higher in antegrade group (P = 0.804), whereas most of the major complications (Clavien Grade III or more) occurred only in the URSL group (P = 0.007). Blood transfusion was required only in the APCUL group (7.8% versus 0%; P = 0.50). In the URSL group, stone retropulsion occurred in four patients, of which three subsequently required shock wave lithotripsy and one required percutaneous nephrolithotomy in a second sitting. Conclusion: APCUL has better stone-free rates as compared to URSL for an upper ureteric calculus of size 10–20 mm. Although the postoperative minor complications are higher in the antegrade group, severe complications occurred only in the retrograde group. Hence, antegrade approach can be considered as the preferred option to achieve better stone clearance in a single sitting with acceptable morbidity and complication rates. The technical advancements in urology have profoundly changed the management of upper ureteric calculus. Before the introduction of shock-wave lithotripsy (SWL) in 1980, open ureterolithotomy or basket extraction of stones under fluoroscopic guidance were the mainstay of treatment. However, currently, the blind basket extraction technique is obsolete, and open ureterolithotomy has been replaced by laparoscopic ureterolithotomy which is limited to a few indications such as a large, impacted calculus not amenable to SWL or endoscopic procedures. A variety of minimally invasive treatment options are available for upper ureteric calculus including observation, SWL, retrograde ureteroscopic lithotripsy (URSL) and antegrade percutaneous ureterolithotripsy (APCUL).,,,, For ≤10 mm sized stones, both the American Urological Association as well as the European Association of Urology recommend observation for a period of 4–6 weeks in a well-informed patient without signs of infection or high-grade obstruction and well-controlled colic on analgesics., The success rate with observation is higher if the stones are ≤5 mm in size whereas >50% patients with a stone size of 6–10 mm will ultimately require some type of surgical intervention. When observation fails, the options are either SWL or URSL. Stone-free rates with SWL or URSL are comparable for stones of ≤10 mm in size., The controversy exists regarding the management of >10 mm sized upper ureteric calculi. URSL has higher stone-free rates,, in a single sitting but at the cost of higher morbidity and complication rates when compared to SWL (11% vs. 4%). Currently, percutaneous access for upper ureteric calculus is recommended only in few special situations such as large impacted calculi that have failed other modalities of treatment, stones associated with distal-ureteric stricture or stones in patients with urinary diversions. In literature, stone-free rates with URSL for a large upper ureteric calculus of size >10 mm range between 71% and 87% with the stone retropulsion rates ranging from 5.4% to 27.7% amongst various studies., However, the role of percutaneous access had been assessed only for large, impacted calculi with a reported stone-free rates of >90%–95% in multiple prospective studies,,,, with a complication rate similar to that of standard percutaneous nephrolithotripsy (PCNL). Furthermore, there is an added advantage of ability to remove concurrent renal calculi. Hence, percutaneous ureterolithotripsy can be utilized for upper ureteric stones of size >10 mm with better stone-free rates and reduced need of secondary procedures to clear the retropulsed stones at an acceptable morbidity and complication rate. Here, we compared URSL with antegrade ureterolithotripsy for upper ureteric calculi of size 10–20 mm with regard to stone clearance, morbidity, and complications. In this study, we prospectively enrolled 117 patients presenting with a solitary upper ureteric stone between December 2014 and June 2017. Institutional ethical committee approval was obtained before the start of the study. The advantages and disadvantages of both procedures were explained to the patients preoperatively and informed and written consent was obtained. The inclusion criteria for the treatment were as follows: upper ureteric stone with longest diameter (10–20) mm by X-ray of kidney, ureter, and bladder (KUB) region and ultrasonography and located between the ureteropelvic junction (UPJ) and lower border of L4 vertebral body. Intravenous urography or computed tomography (CT)-urography was performed in all the patients with normal renal function. Patients with deranged renal function underwent non-contrast CT-scan. Patients with renal insufficiency (creatinine >2.5 mg/dL), morbid obesity, coagulopathy, concurrent renal and ureteric stones, pregnancy, sepsis, stone size <10 mm or >20 mm, orthopedic contraindications for prone position and those with a probability of inability to achieve a safe access to the collecting system on pre-operative imaging were excluded from the study. For the study purposes, impacted stones were defined as stones without visible contrast beyond the level of the stone on preoperative contrast study and/or inability to pass a guidewire across the stone per-opertatively. Antegrade ureterolithotripsy was performed under general anesthesia in prone position. After induction, a 6 Fr open-ended ureteric catheter was inserted under cystoscopic guidance in lithotomy position, and then, the patient was turned prone. Patients with an impacted calculus, in which guidewire was not negotiable beyond the stone, underwent initial puncture with 21-g spinal needle under ultrasonographic guidance followed by antegrade nephrostogram to guide the final puncture. On nephrostogram, the superior posterior or middle posterior calyx was chosen for needle puncture using an 18-g needle according to the pelvicalyceal anatomy. Percutaneous access was made using the “eye of the needle” (Bull's eye) technique and was confirmed by aspiration of urine. Then, a 0.035' terumo guidewire was inserted into the collecting system, and the tract was dilated serially by Amplatz dilators up to 28/30 Fr depending on the stone size, and a corresponding Amplatz sheath was used. A 24/26-Fr nephroscope (Karl Storz, Tuttlingen, Germany) was used and the stone was removed either intact [Figure 1]. or after fragmentation with pneumatic/holmium laser lithotripter. If it was not possible to approach the stone with nephroscope, a 7/8-Fr semirigid ureteroscope (Karl Storz, Tuttlingen, Germany) or a 22-Fr cystoscope (Karl Storz, Tuttlingen, Germany) was used Complete stone clearance was confirmed fluoroscopically as well as endoscopically. A 6-Fr double-J stent was placed if there was mucosal edema or mucosal injury during the procedure. At the end of the procedure, patients who required a supracostal puncture underwent fluoroscopy to rule out any chest complications. A 20-Fr nephrostomy tube was placed in all patients and was removed after 1–5 days depending on the color and amount of urine. DJ stent was removed after 3–4 weeks, but in patients with marginally compromised renal functions, DJ were kept up to recovery of renal function upto a maximum of 6–8 weeks. URSL was performed with a 7/8-Fr semirigid ureteroscope under spinal anesthesia in lithotomy position. A 0.035' Terumo guide wire was inserted into the ureter and the ureteroscope was negotiated. Stone was fragmented with the Holmium: YAG laser at the setting of 0.6–1.0 J and 8–10 Hz using a 365/550 μ fiber. The residual fragments were flushed or extracted by grasping forceps. A 6-Fr double-J stent was placed after the procedure in all patients. The stent was removed after 1 month in all the patients except those with ureteric perforation, where it was removed after 6-8 weeks. Mean anesthesia and mean operative time were recorded. For URSL, the mean anesthesia time was defined as time from spinal needle puncture for anasthesia till the evacuation of stone fragments from urinary bladder after the completion of URSL and mean operative time started from insertion of ureteroscope through external urethral meatus till the same endpoint. For APCUL, mean anesthesia time was the time from induction of general anesthesia till the extubation while the mean operative time was time from initial puncture of calyceal system till the fixation of nephrostomy tube with the skin. Stone-free status was defined as no residual stones or the presence of residual stones ≤4 mm size on X-ray KUB and ultrasound sonography performed at 1 month after the procedure. The follow-up was performed at 1, 3, 6, and 12 months' interval. The two groups were compared regarding the stone clearance rate as the primary outcome measure and anesthesia/operative time, complication rate, and mean hospital stay as the secondary outcomes. Surgical complications were defined according to the modified Clavien-Dindo classification system. The results are presented as mean ± standard deviation. All the parameters were analyzed statistically using the analysis of variance, Fisher's exact test, and Chi-square test. P < 0.05 was considered statistically significant. Out of the total 143 patients who qualified for the study 14 opted for SWL. Remaining 129 patients underwent surgical intervention. Twelve patients were lost to follow-up. Finally, 117 patients were analyzed, 53 in the URSL group and 64 in the antegrade ureterolithotripsy group. The demographic data was comparable between the two groups [Table 1]. Mean stone size in the URSL group was 14.82 ± 1.82 mm and in the APCUL group, it was 15.32 ± 2.24 mm (P = 0.213). The mean distance between UPJ to stone in both the groups was almost the same (URSL - 2.95 ± 0.80 cm, APCUL - 2.87 ± 0.71 cm; P = 0.56) [Table 2]. The mean anesthesia time was found to be significantly longer for the antegrade group (URSL - 72.92 ± 13.92 min, APCUL - 86.25 ± 14.14 min, P < 0.001) while the mean operative time was significantly longer for the URSL group (URSL-60.09 ± 12.77) as compared to the antegrade group - (49.53 ± 9.07, P < 0.001). In the antegrade group, to get to the stone, a ureteroscope was required in 24 patients (37.5%) and the cystoscope in 16 cases (25.0%) whereas the nephroscope [Figure 1]. was able to reach the stone in the remaining 24 patients (37.5%). In the antegrade group, a supracostal puncture was required in 21 patients (32.81%) for the proper alignment and approach to the calculus. Among these, 19 were supra - 12th while 2 were supra - 11th punctures. None of these patients developed any post-operative chest complication. After the procedure, a double-J stent was placed in all the patients of URSL group, while in the antegrade group, it was placed in only 21.86% of the cases (P < 0.001). Patients of the antegrade surgical group had longer post-operative hospital stay. Although the difference was only of around 6 h but was statistically significant (URSL - 30.26 ± 9.37 h, Antegrade - 36.02 ± 13.99 h, P = 0.012). Complications were reported and graded according to the modified Clavien-Dindo classification for post-surgical patients. In the antegrade group, out of a total 12 complications, ten (83.33%) were Grade-I and two (16.67%) were Grade-II and there were no complications above Grade-II. In the URSL group, total nine complications occurred. Among these, three (33.33%) were of Grade-I, five (55.56%) were of Grade-IIIa, and one (11.11%) was of Grade-IIIb [Table 3]. Although the complication rates were somewhat higher in the APCUL group (18.75% vs. 16.98%, P = 0.80), but higher-grade complications were noted only in the URSL group (11.3% vs. none, P = 0.007). Complications in the antegrade ureterolithotripsy group included a fever of >38.5°C in seven (10.94%), gross hematuria in five (7.81%), and requirement of blood transfusion in two (3.13%) patients [Table 4]. In the URSL group, the only minor complication noted was fever in three (5.66%) patients. During the procedure, stone retropulsion occurred in four (7.55%) patients. Later on, SWL was performed in three and PCNL in one of these patients. Two patients had (3.77%) ureteric perforation and developed urinoma in the post-operative period but were managed successfully by double-J stenting and ultrasonographic-guided aspiration. None of the patients in URSL group developed gross hematuria or required blood transfusion. The postoperative pain was assessed by the visual analog scale (VAS) scoring system. The mean pain score in APCUL group was significantly higher as compared to the URSL group (APCUL - 1.50 ± 2.04, URSL - 0.85 ± 1.39, P = 0.048). The mean follow-up of patients were 8.46 ± 4.83 and 7.86 ± 4.77 months in the URSL and the antegrade ureterolithotripsy group, respectively (P = 0.14). Stone-free rate at 1-month follow-up was significantly higher in the antegrade group as compared to that in the URSL group (93.75% vs. 81.13%, P = 0.036). Fifteen stones (28.30%) in the URSL group and 19 (29.69%) in the APCUL group were impacted (P = 0.87). During surgery, 26.6% of the stones were removed intact in the APCUL group, and this may be the reason for the higher stone clearance rate. The optimal management of upper ureteral stone is still a matter of debate. Currently, the recommendation for calculus of size ≤10 mm is observation for a period of 4–6 weeks. If conservative management fails and for stones >10 mm, intervention with either SWL or URSL is recommended. Stone-free rates for >10 mm size calculus with SWL and URSL is around 70% and 80%, respectively.,,,,,, Furthermore, multiple treatment sessions of SWL are required for larger stones and there are chances of stone retropulsion with URSL. Hence, there is a need of a procedure that can provide better results. Antegrade approach for upper ureteric calculus is recommended for large impacted calculus and provides a high stone-free rate (>90%).,,,, It helps avoid secondary interventions for retropulsed stones seen during URSL. Therefore, it can be considered a preferred approach for all such stones. Most of the previous studies have reported that the mean operative time is significantly higher in the antegrade approach, mainly because of the establishment of the percutaneous access. However, the exact starting and end point of operative time calculation have not been properly defined. Our results differ from previous studies, with significantly longer mean anesthesia time in the antegrade approach group whereas, the mean operative time was significantly longer in the URSL group. This may be attributed to the extra time required for ureteric catheter placement and turning the patient in prone position during antegrade approach. In our study, the overall complication rate was higher in the APCUL group as compared to the URSL group, but this did not achieve statistical significance (18.75% vs. 16.98%, P = 0.804). However, when we graded the complications according to the modified Clavien-Dindo classification, we found that all the complications which occurred in the APCUL group were minor (Grade I or II), while the major complications (Grade III or higher) occurred only in the URSL group and this difference was statistically significant (P = 0.007). Major complications result in increased morbidity, psychological stress, increased Double-J stent dwell time, requirement of secondary intervention, and risk of additional interventions. While patients of the antegrade group suffered more pain, had higher rates of gross hematuria requiring blood transfusion (in two patients) and had longer postoperative hospital stay, they were saved from the morbidity related to major complications. Zhang et al. also found insignificantly higher overall complication rates with the antegrade approach (P = 0.398) but without any major complications. The reason might be the use of flexible ureteroscopy, which can address the retropulsed stones in the same sitting. Maheshwari et al. also found no major complications in antegrade group while there was a 10% incidence of ureteric perforation and 45% of patients required SWL for stone retropulsion in the URSL group. There were a few limitations of our study. First, the patients were not randomized to either mode of treatment and the second being small sample size. In future, randomized, and large sample-studies are required to confirm our results. 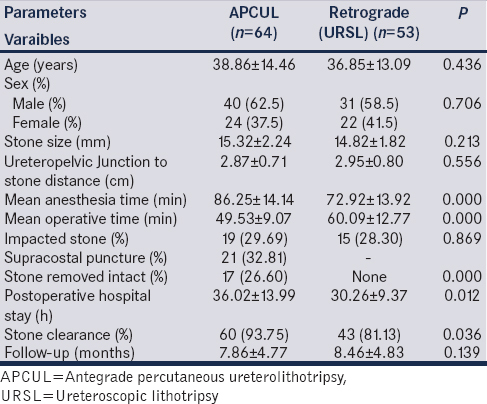 Antegrade percutaneous approach has better stone- clearance rates as compared to the retrograde approach (URSL) for an upper ureteric stone of size 10–20 mm. Although the postoperative minor complications were more in the antegrade group, severe complications occurred only in the retrograde group. Hence, antegrade approach can be considered as the preferred option to achieve higher clearance rate in a single setting with acceptable morbidity and complications. Chaussy C, Schüller J, Schmiedt E, Brandl H, Jocham D, Liedl B, et al. Extracorporeal shock-wave lithotripsy (ESWL) for treatment of urolithiasis. Urology 1984;23:59-66. Assimos D, Krambeck A, Miller NL, Monga M, Murad MH, Nelson CP, et al. Surgical management of stones: American Urological Association/Endourological Society Guideline, PART I. J Urol 2016;196:1153-60. Turk C, Knoll T, Patrik A, Sarica K, K. Sarica, A. Skolarikos, et al. EAU Guidelines on Urolithiasis. Uroweb 2016. p. 25. Segura JW, Preminger GM, Assimos DG, Dretler SP, Kahn RI, Lingeman JE, et al. Ureteral stones clinical guidelines panel summary report on the management of ureteral calculi. The American Urological Association. J Urol 1997;158:1915-21. Liong ML, Clayman RV, Gittes RF, Lingeman JE, Huffman JL, Lyon ES, et al. Treatment options for proximal ureteral urolithiasis: Review and recommendations. J Urol 1989;141:504-9. Ziaee SA, Halimiasl P, Aminsharifi A, Shafi H, Beigi FM, Basiri A, et al. Management of 10-15-mm proximal ureteral stones: Ureteroscopy or extracorporeal shockwave lithotripsy? Urology 2008;71:28-31. Park H, Park M, Park T. Two-year experience with ureteral stones: Extracorporeal shockwave lithotripsy vs. ureteroscopic manipulation. J Endourol 1998;12:501-4. Kato Y, Yamaguchi S, Hori J, Okuyama M, Kakizaki H. Improvement of stone comminution by slow delivery rate of shock waves in extracorporeal lithotripsy. Int J Urol 2006;13:1461-5. Preminger GM, Tiselius HG, Assimos DG, Alken P, Buck C, Gallucci M, et al. 2007 guideline for the management of ureteral calculi. J Urol 2007;178:2418-34. Preminger GM. Management of ureteral calculi: The debate continues. J Urol 1992;148:1102-4. Khalil M. Management of impacted proximal ureteral stone: Extracorporeal shock wave lithotripsy versus ureteroscopy with holmium: YAG laser lithotripsy. Urol Ann 2013;5:88-92. Turkan S, Ekmekcioglu O, Irkilata L, Aydin M. Is semirigid ureteroscopy sufficient in the treatment of proximal ureteral stones? When is combined therapy with flexible ureteroscopy needed? Springerplus 2016;5:30. Aravantinos E, Anagnostou T, Samarinas M, Ioannides K, Ziavliakis K, Ntafos A, et al. Two-step minipercutaneous ureterolithotripsy under multimodal analgesia for complicated impacted calculi in proximal ureter. Urology 2013;81:1147-52. Long Q, Guo J, Xu Z, Yang Y, Wang H, Zhu Y, et al. Experience of mini-percutaneous nephrolithotomy in the treatment of large impacted proximal ureteral stones. Urol Int 2013;90:384-8. Goel R, Aron M, Kesarwani PK, Dogra PN, Hemal AK, Gupta NP, et al. Percutaneous antegrade removal of impacted upper-ureteral calculi: Still the treatment of choice in developing countries. J Endourol 2005;19:54-7. Zhang Y, Yu CF, Jin SH, Zhu H, Na YQ. A prospective comparative study between minimally invasive percutaneous nephrolithotomy in supine position and flexible ureteroscopy in the management of single large stone in the proximal ureter. Urology 2014;83:999-1002. Bozkurt IH, Yonguc T, Arslan B, Degirmenci T, Gunlusoy B, Aydogdu O, et al. Minimally invasive surgical treatment for large impacted upper ureteral stones: Ureteroscopic lithotripsy or percutaneous nephrolithotomy? Can Urol Assoc J 2015;9:E122-5. Miller NL, Matlaga BR, Lingeman JE. Techniques for fluoroscopic percutaneous renal access. J Urol 2007;178:15-23. Turk C, Knoll T, Petrik A, K. Sarica, A. Skolarikos, M. Straub, et al. Guidelines on Urolithiasis. European Association of Urology; 2014. Available from: http://www.uroweb.org/gls/pdf/22%20Urolithiasis. [Last accessed on 2015 Feb 25]. Maheshwari PN, Oswal AT, Andankar M, Nanjappa KM, Bansal M. Is antegrade ureteroscopy better than retrograde ureteroscopy for impacted large upper ureteral calculi? J Endourol 1999;13:441-4.